Jose Mourinho said he wouldn’t have chased Antonio Conte to the middle of the pitch where he was celebrating with his Chelsea players to have a handshake with him. 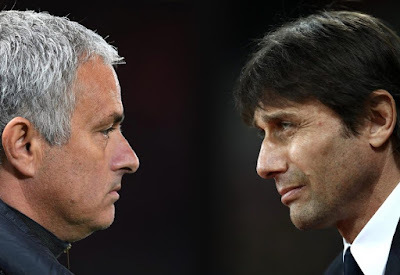 Conte ran off to the pitch immediately after the final blast instead of greeting his counterpart on the losing side after the 1-0 win against Manchester United on Sunday. Mourinho reacted to the apparent handshake snub by saying that congratulating Conte’s assistant had been enough. The Portuguese told reporters, “You want me to go and chase him in the middle of the pitch? I was there. “I shook hands with the people who were there. I think one of them was his brother, the assistant, so I feel that, by shaking the hands of his brother and the other assistants, I did my duty.